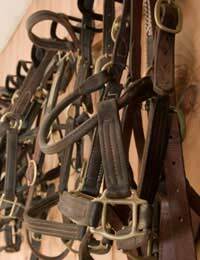 Tack shops and equestrian business supplies are specialist commercial premises. They are involved in the provision of merchandise for both the weekend rider and professional stables; from hoof picks to horseboxes! If the business is a large wholesalers a lot of the work will entail stock-taking and the preparation of orders to smaller businesses. Space is money, so the fast turnover of goods is essential to profit-making and maintaining good relationships with clients. Knowing what’s what and where is very important, particularly when there could be so many different brands of one product. Accurate record-keeping is a definite asset and good communication skills necessary. For those with an HGV licence, there may be further opportunities to work on the delivery side of the business. Work in a local tack shop is a far more personal job. There is increased direct customer contact. The opportunity to advise and take time to help clients in their selection of goods and services can be very rewarding. This sort of personal service also helps to promote the reputation of the business. A rapport is built up with regular customers, who in turn recommend, by name, the staff they get to know. An interest in all things horsy is a must! People who work in tack shops are not expected to be experts in everything related to equestrianism but a good, general, knowledge of the products they deal with is an advantage. Other equine-related businesses will be pleased to have their calling cards on display in tack shops and vice versa. This is a useful source for customers and it enables employees to access other specialist areas within the industry. Before working in a tack shop or equestrian supplies business it is a good idea to build on existing knowledge of tack and equipment. Products on sale in equestrian businesses can cover huge ranges, depending on how much space is available and what best suits local demand. Safety standards apply to a significant amount of riding equipment so suppliers must keep up to date with safety specifications and make sure their products comply with relevant laws. Horse rugs, saddles and other bulky items need careful storage and security against theft/accidental damage; but they must be reasonably accessible to potential customers! Tack shop assistants may be expected to climb ladders and carry heavy stock. Many tack shops use large feed bowls that are for sale as containers for smaller goods. Packets of horse treats and mineral/salt licks, along with information of feeds and supplements, can be strategically placed in these feed bowls to tempt buyers! Measuring is one area that can cause confusion; whether the item is for a horse or a person. It helps to know how to measure horses for rugs, saddles and bridles and people for boots, jodhpurs and hats! Many tack shops have their own workshop where they do repairs and make tack to order. For the untrained person working in the shop, this can be another great opportunity to learn. The more experienced equine business person may be invited to attend horse shows and events with a mobile tack shop, if the business has that facility. Qualifications are not necessary for general work in tack shops and equestrian business supplies; though people with a horsy background and knowledge of tack will have an advantage over those who have not. The work is varied, mainly indoors and can be a useful start for people who are interested in equine pursuits but not sure where to begin. Working in this environment can lead to other openings and further development of specific interests.